In the past few weeks, I’ve been hearing from old friends, my in-laws — and even a total stranger — about my article in the latest issue of the Journal of San Diego History. Most San Diegans know that our largest high-tech enterprise of the past decade is Qualcomm, a Fortune 500 company. Qualcomm—founded by Irwin Jacobs and Andrew Viterbi and five others—is recognized locally for the wealth that it created for founders, employees, and investors. It also enjoys a reputation for helping to fund many local philanthropic and charitable efforts. 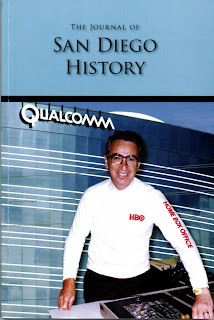 Outside the local telecommunications industry, however, few people realize that the Qualcomm was the second company founded by Jacobs and Viterbi, not the first. The earlier startup, Linkabit, moved from Los Angeles to San Diego in 1971 and, over the next twenty-five years, helped to generate more than two hundred separate telecommunications companies. A series of fortunate coincidences—rather than a carefully thought out economic strategy—is the main reason why San Diego has a significant telecommunications industry. This article traces the paths of Jacobs and Viterbi from their New England childhoods to their Massachusetts Institute of Technology (MIT) engineering degrees to the founding of Linkabit. It shows that Linkabit—its early application of cutting-edge communications technologies, its eventual sale, and the eventual dispersal of the company’s key engineering talent—was the catalyst that led to other new companies, including Qualcomm. Because I expect to write other articles for the journal, I wanted my first JSDH article to tell the back story that few people know. Meanwhile, the journal wanted something with the “Q” word so that people would know why they were reading it. To achieve both goals, I worked with USD history professors Iris Engstrand and Molly McClain, who edit the journal on behalf of the San Diego Historical Society. Overall, we are all proud of the article. For me, it’s a chance to introduce myself to my hometown audience. For the JSDH, it’s a chance to get more local technology history in the journal. What I really enjoyed was the chance to use so many photographs — something that’s never possible in an academic journal (except for a history journal). 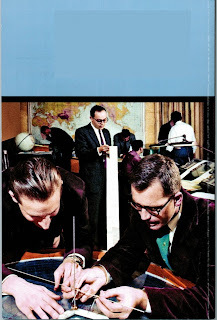 Most prominent were the color photos of Jacobs and Viterbi on the cover. Beyond these two men, I also got photos from Martha Dennis and some really cool ads from various archives. Together, they give a sense of what it was like for the Linkabit founders and employees back in the 1970s and 1980s. The full article will eventually be online at the JSDH website. The historical society sells memberships (with subscriptions) at $40/year or back copies at $20 each. Update, December 2009: The article is now available at the JSDH website. Thanks for sharing this link/announcement. I linked to it from the UC San Diego Jacobs School of Engineering communicatiosn blog.